Before Twitter and Tumblr: Thinking about older anime blogs – Nigorimasen! Anime blogs, then and now, reflect the watching habits of their authors and the conversations happening among anibloggers as well as the general fan community. When I started up a Wordpress-hosted blog in May 2006 during my sophomore year in college, I was writing episodic posts about the first Haruhi Suzumiya series, Welcome to the NHK (which I still haven’t finished after all these years…) and Honey and Clover II among other topics. Lucky Star was the series to talk (and, for some people, complain about) in spring 2007 – it was one of many things discussed at an all-aniblogger panel (State of the Aniblogosphere) I was on with lolikit and Spiritsnare at Fanime 2007. Most of the new stuff that was written about around 2006-2007 was obtained through fansubs – there were no real legal anime streaming websites (at least in the US) until ADV’s Anime Network began streaming episodes on a regular basis in November 2007 and BOST TV launched later that November. Crunchyroll made a simulcast deal with Gonzo that began in April 2008, though it wasn’t until January 2009 that they announced its removal of user-uploaded episodes. Reading over Impz’s 2008 chronological history of notable anime blogs again has me wanting someone to update it through the mid-2010s since it feels like many noteworthy bloggers have come onto the scene in the past 6+ years. Unfortunately, I don’t think I could undertake such a task since I feel out of touch with a significant portion of the current aniblogging community, partly from personal preferences but also not knowing who else I should begin reading along with those I currently follow. The stalwarts I recall who are still actively writing include omo, Kabitzin, otou-san, Author, JP & Hinano, Evirus, Yumeka, Mike & Ray, Carl (sdshamshel), Alain & Kate, Evan Minto (VamptVo), bateszi, chaostangent, Martin and TheBigN [kind of]… I’m sure there are some others I forgot to mention. Among those who have moved on to other things (or have moved mainly to Twitter) are Jeff Lawson, Michael, Hung, ghostlightning, thaliarchus, Josh, OGT, eternal, Canon, Garten (of Memento)… Again, I probably forgot a bunch of people – feel free to yell at me on Twitter or in the comments if you remember more. Tagged anibloggers, aniblogosphere, anime blogs, Blogging, history, reminiscing. That’s alot of nostalgia for just a few years ago. I’ll miss those times but time moves on. I’ve gone to kurogane for years now. ah yes, I came across kurogane’s blog again while collecting links. I do remember reading some posts a while ago but not on a consistent basis. thanks for bringing it up! 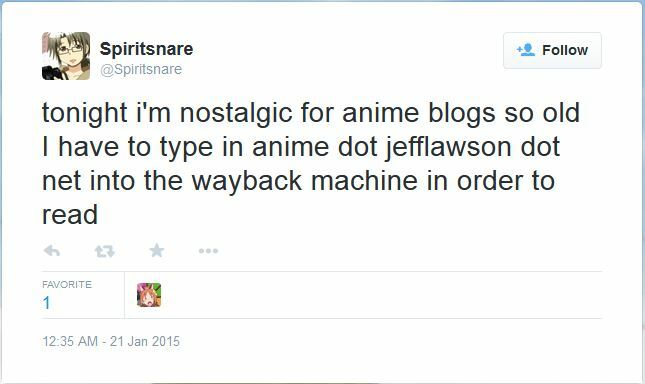 You know, I’ll always remember Jeff Lawson as the anime blogger who gave Ogiue Maniax its first big exposure. I just woke up one day to see like 200 hits come in, and I well thought I would never surpass that. A big name is probably Tiamat (RIP). Of all the anime bloggers out there, his story is probably the most memorable. What about SDB (Chizumatic)? When he quit political blogging, he was pulling at least tens of thousands hits, maybe hundreds (Insty did a million, and I think USS Clueless as about as big as LGF). The majority of his anime readers now were his political readers back then. Also, Tappan animeblogged in 2006. Yes, I just did “grep href= ani-nouto/repo/2007/*.txt”. It’s Lawson, Omo, Miao, etc. I think when it comes to today’s aniblogging community I am sure you can jump in and follow any one of them whenever you really click with some bloggers. I know for a fact that there are some new anime blogs popping up all the time and it should be fun to see their growth over their blogging timespan. Of all the older bloggers who are still active. I only know Yumeka. Funny she just commented above! But yeah. Things with screencaps and streaming has become easier today to help develop anime blog content. It surely is the best time to be aniblogging. I don’t think this is just a simple coincidence, but I might really be looking back to this day, specifically to this moment I read this post, every now and then. If I didn’t read this, maybe I would forever live oblivious of the fact that one of the biggest figures in anime blogging (Michael of http://animeotaku.animeblogger.net/) is actually the older brother of my high school friend and I’ve known him ever since. Wow. I still can’t believe it. To think that a famous person that I’ve talked to several times before was actually a big-name blogger already. Pingback: Taking Some Advice from “Build Your Anime Blog” | Nigorimasen!